Lately, every Rue team conversation has ended in a discussion of who we love, hate, and love-to-hate (ahem, Chad) on the Bachelorette. Since many on our team have been fans of the show since the beginning, we love hearing about the lives of past contestants. 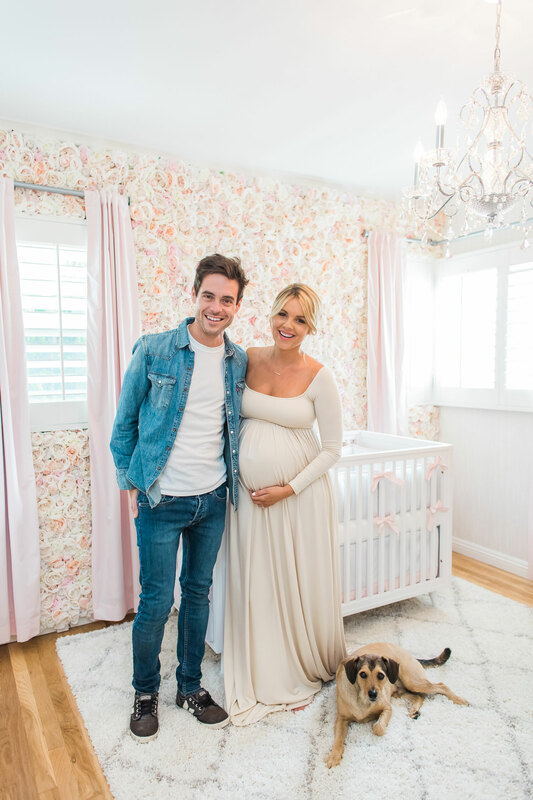 So we are incredibly pleased to share this gorgeous, super-girly nursery from Ali Fedotowsky, from Season Six of the Bachelorette. Ali and her fiancé, Kevin Manno, welcomed their daughter Molly at the beginning of July. 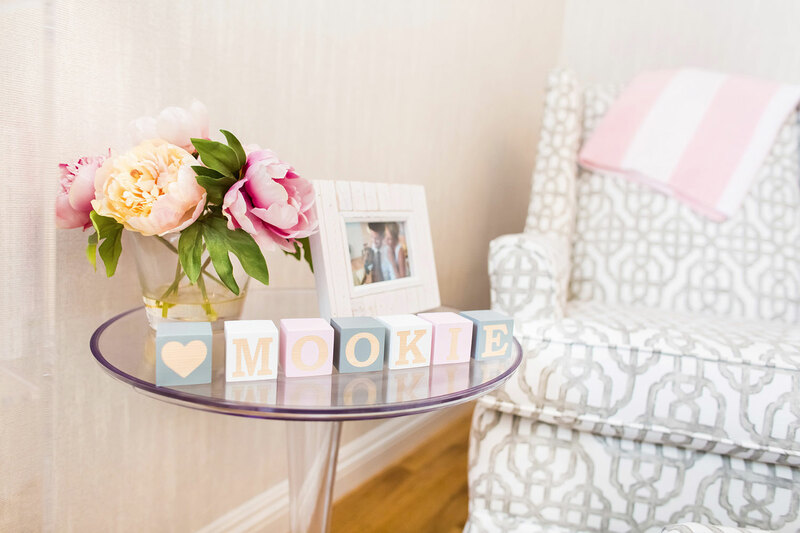 Ali shares her transition to motherhood below, and in the slideshow, see the nursery and an interview with the room’s designer, Vanessa Antonelli. Congratulations on becoming a mom! Since this is your first child, what was your vision for the space? To be honest I didn’t have a strong vision for the space, but I knew I wanted it to feel light and airy so it would fit the feel in the rest of our house. When I first met with my designer Vanessa, I told her that I didn’t want the room to be girly at all, but after taking a look around my house, Vanessa discovered that my style is actually very feminine. Girly in my mind meant hot pink and bling, which is so not my style! Vanessa really took that time to get to know me and sure enough, she was right. 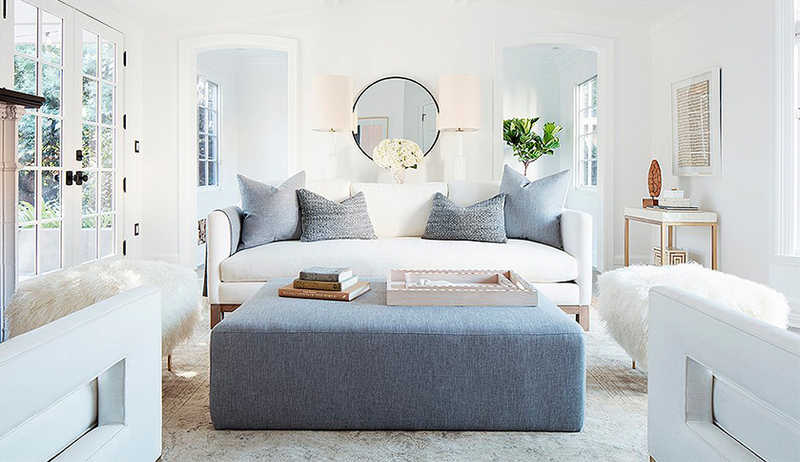 I love a pretty feminine room! You’ve spoken about being on bed rest during your pregnancy. How did that affect the process of creating the nursery? I was on bed rest the entire time the nursery was coming together. I was disappointed because I really wanted to be a part of that process but I just couldn’t do much. Instead of putting things together, I sat in the glider in the room with Kevin while he assembled the crib, etc. He also hung the entire flower wall one panel at a time! My major contributions involved hanging clothes in the closet and getting Kevin a beer while he was working. Teamwork is essential! What are your favorite parts of the nursery’s design? I love the flower wall! I just know when Molly is three or so, she’ll invite all her little friends over to see her “princess flower wall” and I can just imagine how proud she’ll be of it. That, or she’ll hate all things girly and want a fire truck room. Ha! I am completely obsessed with her closet. I had no idea a small little closet could be both that beautiful and functional. Lisa Adams from LA Closet Design really went above and beyond to make sure Molly’s closet was absolutely perfect. My favorite details are the little bunny ear drawer handles and the rose gold mirror in the back of the closet. Those details make the closet extra special. What has surprised you most about your first month of motherhood? Honestly I’m most surprised that it’s not as hard as I thought it would be. So many people told me and Kevin that the first few weeks of her life would be the hardest weeks of our lives. When I was pregnant and not sleeping because I was in pain, so many moms would say, “just wait until she’s born…” followed by some negative story about how I was in for it. I was honestly terrified at one point because of all the negativity I heard. Is motherhood hard? Absolutely. I barely sleep at night because I am breastfeeding on demand and Molly wakes up every 1.5-2 hours. But she’s a relativity easy baby and I have the best partner in the world, so we are doing great and really enjoying being parents! If she was a colicky baby and I was a single mother, I would be singing a very different tune. In fact, Kevin and I constantly talk about how hard this would be for a single parent! I now have so much respect for people who go at this alone! I am very aware that I am saying this 3 weeks into motherhood, and next week I might be singing a very different tune. See the nursery in the slideshow! The flower wall is very pretty, but those flowers will be dusty immediately and anyone with dust allergies will suffer big time in there. Additionally, all of those flowers pose a choking hazard for your sweet baby-to-be if they’re pulled off the wall. Please consider the baby’s safety first. It looks beautiful but is too hazardous (and unsanitary) for a nursery. I agree! I’d be terrified to leave a baby under all those flowers. A choking hazard for sure should a petal or flowers fall off. And please don’t spray them with Fabreeze instead of vacuuming. That stuff alone can cause SIDS as all the masking scents and agents in “detergents” can. It’s a lovely idea but suited more for little girls 6+ and perhaps not above the bed?! Dust doesn’t worry me nearly as much. Kids who grow up with a little dust, dirt, pets, open windows, etc., are usually much healthier! Love the closet organization, but the first thing I thought of when I saw the flower wall was the dust and possible choking hazard. At least move the bed against a painted wall. Also, the use of bumper pads in the crib is strongly discouraged by pediatricians as another danger to infants.